Mike & Kung always knew that they wanted a destination wedding from the moment they got engaged. The fun-loving couple, who now call San Francisco home, first met in the wee hours of the morning at a local club’s after-party. They hit it off immediately, and only a few years later, Mike proposed to Kung during a concert at Coachella. Just after Mike’s proposal in 2016, they decided to visit Maui for the first time for a little tropical getaway. With a bit of quick research, they stumbled upon Maui’s lil neighbor island called Lana’i (nicknamed the “pineapple island”), and were intrigued by the descriptions of its uncrowded, serene panoramas. So it was soon into their Maui vaca that they excitedly boarded the Expeditions ferry to Lana’i, eager for a fun, adventure-filled day across the channel! Lana’i island is actually the smallest publicly-accessible inhabited island in the Hawaiian chain, boasting the lure of quiet, uncrowded beaches, a protected Marine Preserve, epic views of Moloka’i and Maui, and even a popular hike to the top of Pu’u Pehe, known to visitors as Sweetheart Rock. Needless to say, after a day of adventure and tropical eye candy, Mike and Kung instantly fell in love with the island’s picturesque beauty and simple charm. After they arrived back home, they began looking into possible options for a Lana’i wedding, leading them to Trilogy Excursions, our fleet of luxury sailing catamarans, and the gorgeous open air Lana’i-based wedding pavilion, Hale O Manele. Describing it as a “beautiful hidden gem,” Mike and Kung knew it was meant to be. 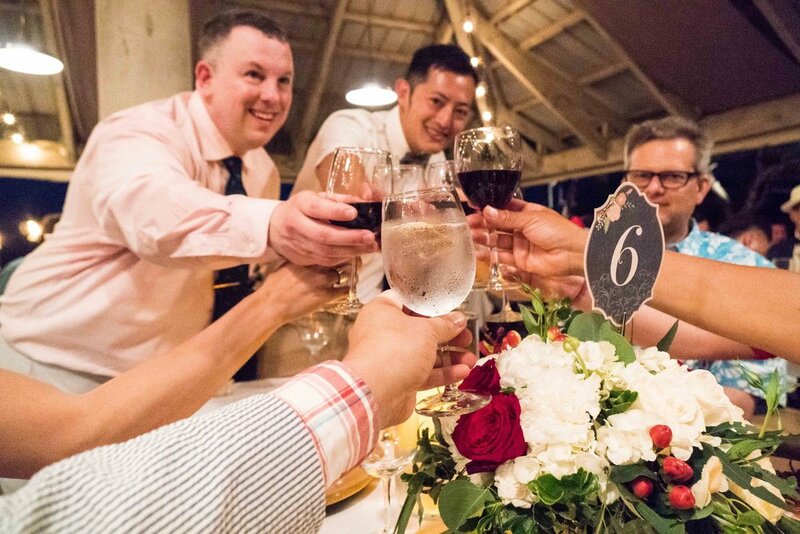 From the start of their planning, the Trilogy team could tell that this couple was all about love & joy, laughter, and having a blast right from the start (their engagement was the perfect example), so they worked seamlessly with Mike and Kung to bring this energy to life for their wedding celebration. Wanting the vibe of their day to be simple at its core - a genuinely fun time in the company of their best friends - the couple requested for decor to have a modern romantic feel, complimented by traditional elegance. 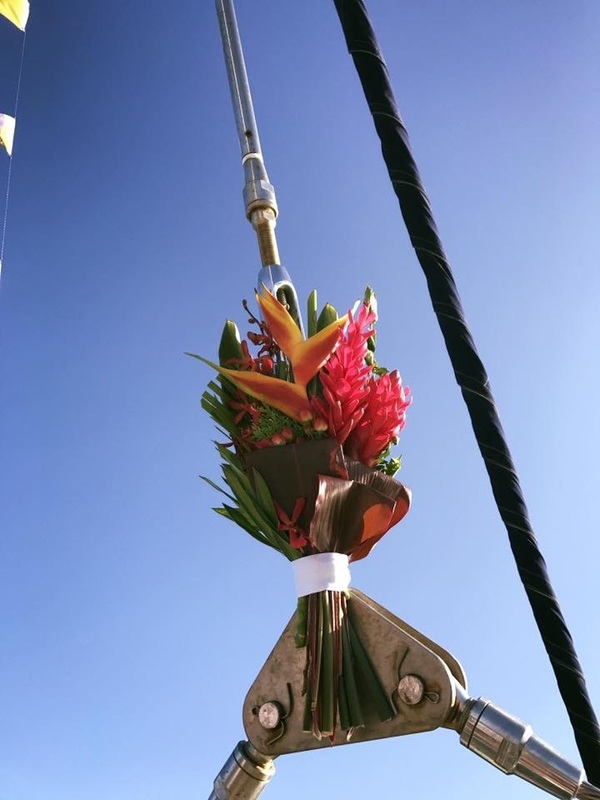 For their wedding sail over to Lana’i, Mike and Kung requested a natural decor at the forefront, with a tropical touch. 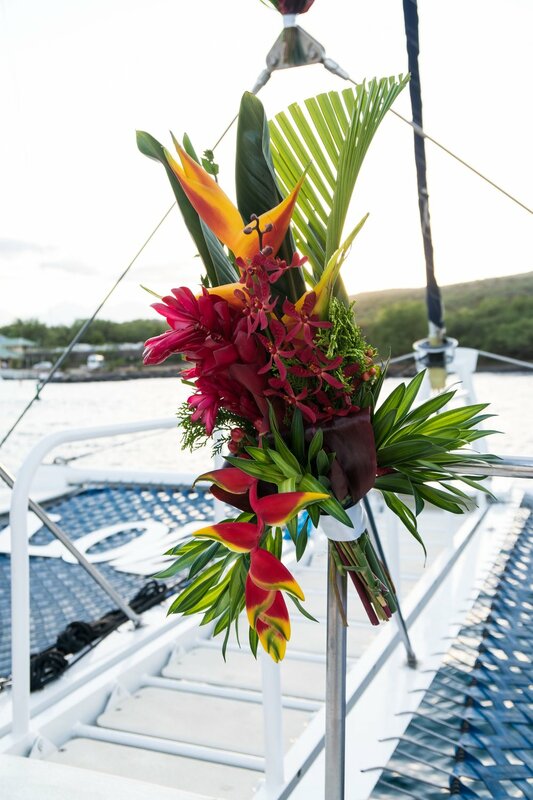 Using a bright dash of Hawaiian accents, Jenny & Taryn chose colorful focal pieces to decorate both the bow and ceremony location on deck. Vibrant orange-and-pink Birds of Paradise and red ginger flowers were offset by the very traditional Hawaiian green Ti leaves, giving a beautiful contrast in color to the sparkling blue ocean backdrop. Thrilled with the result, Mike and Kung, adorned with their custom Maile-style Ti leaf lei’s, couldn’t stop smiling throughout their ceremony-at-sea, surrounded by the picture-perfect dream setting they had imagined. dolphins jumped out of the ocean next to the trilogy catamaran. It was perfect! 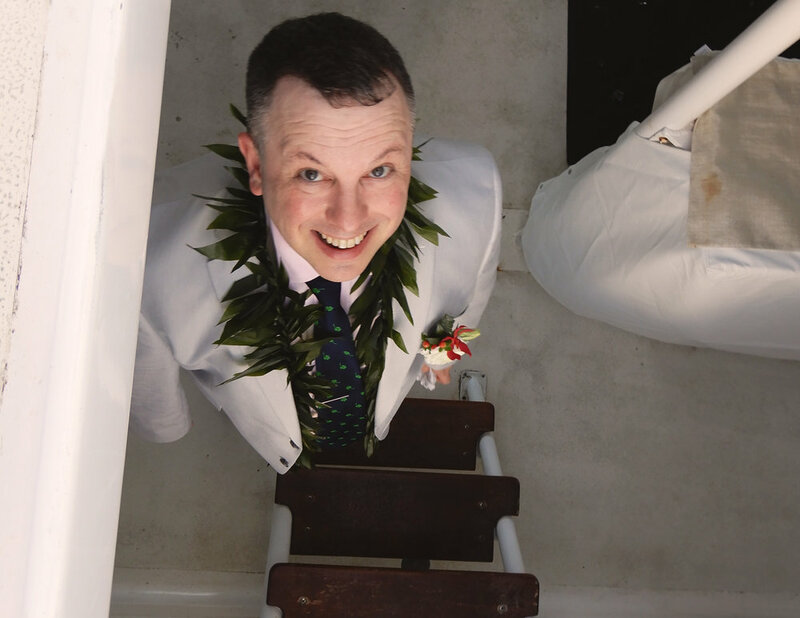 Soon after the ceremony ended, the boat docked at Manele Harbor, and the newly married couple, together with all their guests, made their way up the quick & picturesque 2 minute walk to the Hale o Manele pavilion, which Taryn & Jenny had set-up earlier in the day. At the Hale, traditional white and red rose centerpieces from Petals Maui had been set out, giving a beautiful elegant contrast to the Monkeypod wood tables, covered with simple white linens. Purchased from Etsy, custom table numbers displayed a script font with antique baroque-inspired outlines and painted flower accents, blending the wedding’s theme of modern but traditional romance. The tables’ striking gold chargers, metallic napkin holders and beautifully draped accent lighting from the ceiling tied the whole look together, successfully creating Mike & Kung’s vision of their Hawaiian wedding day. The elegant 3-course dinner, prepared by Island Catering, delighted guests, with a Hawaiian theme focused on freshly sourced seafood and local vegetables (see below for full menu). After dinner, guests danced to music by Lana’i-based musicians, Kapua Entertainment. On the smooth sail home, guests continued to boogie-down beneath a mini disco ball, fastened to the boat’s mast. 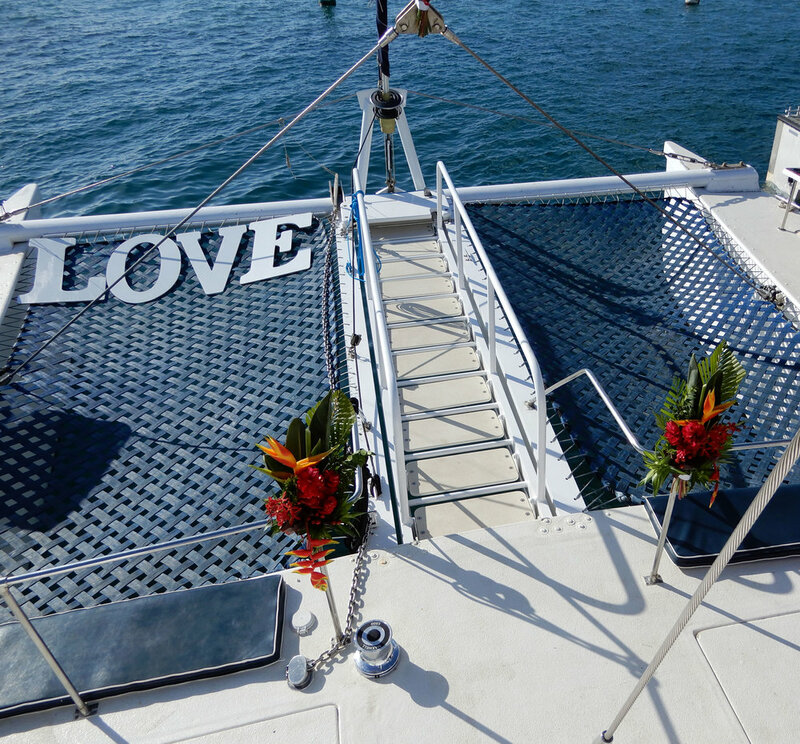 The Trilogy team had also laid out a delicious custom coffee bar for guests to enjoy on their sail back to Maui, rounding out the final touches for Mike and Kung’s picture-perfect wedding - truly a day to remember for this great couple!